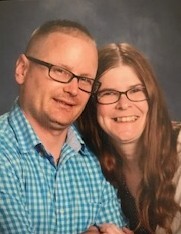 Obituary for Amy K. (Barnhart) Hranek | J. F. Rice Funeral Home, Inc.
Beloved wife, Amy K. (Barnhart) Hranek, 42, went to be with the Lord after a brief illness on January 29, 2019. She was predeceased by her loving grandparents; niece, Trinity Hranek; and cousin, John Rovente. She is survived by her loving family; spouse of 17 years, Charles; parents, Ralph and Ann Barnhart; brother, Joseph Barnhart; parents-in-laws, Thomas and Janet Hranek; brothers-in-law, Bryan Hranek, Chris (Kim) Hranek, Joe (MaLu) Hranek, Aaron Hranek and Jon Hranek; nephew, Donovan; nieces, Elizabeth and Breanna; many aunts, uncles, cousins and friends including military wives. Amy loved animals including her cat, Sabrina and dog, Prince. She also loved children and was an assistant teacher at Family Enrichment. She enjoyed social media including Facebook Groups and Snapchat; country music and line dancing. She also enjoyed travelling and was a devoted Army wife, stationed in Colorado, Germany and North Carolina. She will be remembered as a gentle, loving and caring person who always had a smile on her face. In her last worldly act of love, she was able to save several lives as an organ donor. A Funeral Mass will be offered at St. Thomas Aquinas Church, Highland Avenue, Binghamton, Tuesday at 10 a.m. The family will receive friends at J.F. Rice Funeral Home, Inc., 150 Main Street, Johnson City, Monday from 4-7 p.m. Donations in Amy’s memory can be made to Family Enrichment, 24 Cherry St., Johnson City, NY, 13790 for school supplies or St. Jude’s Children’s Hospital (www.stjude.org).